Who is the PickNPro(TM) guitar hand rest for? 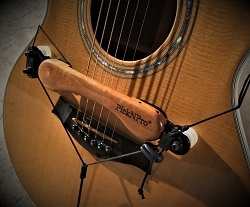 The PickNPro(TM) brand guitar hand rest is useful for a wide range of guitar playing styles and experience levels. Top flatpicking guitar players (especially in bluegrass) and fingerstyle guitarists will enjoy the speed and tone. Beginning guitar students will like the support it provides for strumming, with a reinforcement of proper technique. People with wrist problems, Parkinson's disease, tension, or fatigue may find it helpful, since it allows your wrist to be supported in a loose, relaxed position. We are a very small company, and we value each and every customer. Please feel free to call Nancy for more information: 1-720-593-WRST. Thank you for your support! 1. What does the PickNPro(TM) hand rest do? The hand rest provides a support for your strumming or picking hand which improves technique and increases flexibility, tone, accuracy, and speed. 2. Do I have to modify my guitar to use the PickNPro(TM) hand rest? No. The guitar hand rest is fully removable, with no modifications to the guitar. In fact, the support raises your hand and wrist above the guitar which protects the top from perspiration. 3. Does the PickNPro(TM) hand rest mute the sound or tone of the guitar? Not noticeably. The area between the sound hole and the bridge tends to be a dead area acoustically, so there is very little reduction in power, volume, or projection.